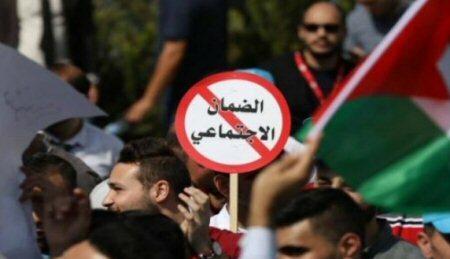 Employees of the Palestinian private sector, in the occupied West Bank, observed a general strike on Tuesday, as thousands staged a sit-in protest outside the Social Security Corporation headquarters in al-Bireh, calling for scrapping the controversial Social Security Law. Shops, businesses, factories, financial institutions and private schools were shuttered in main cities across the West Bank, heeding calls by the Unified Movement to Abolish the Social Security Law, for a general strike. The strike coincided with the first day for compulsory registration set by the government for businesses to join the Social Security Corporation, starting with companies and institutions that have more than 200 employees, with the rest to be sequentially registered by 2020. The law calls for deducting 7.2 percent from the monthly salary of private-sector employees and 8% to be paid by the employer for each worker, for the social-security fund, which set the national retirement age for both men and women at 60 years. Meanwhile, the Palestinian government approved amendments to the Social Security Law ,demanded by some parties in the private sector who were calling for changes in the law rather than abolishing it altogether, as demanded by the Unified Movement.